There are many good reasons Accra should join the rest of the modern world in having covered gutters. We do not have to travel far to relish a city with covered gutters. The nearby Francophone countries are cases in point. We do not understand why the Brits did not introduce us to covered gutters as their colleague colonizers did to their colonies. Maybe it was part of the indigenization policy extended to infrastructure, replicating Parises and Nices outside France. We have continued for rather too long to live with open gutters and thus allowing the dumping of all manner of domestic wastes including night soil from the many houses, still lacking the important amenity, into our gutters. Gordon Guggisberg, the master of Gold Coast infrastructure in spite of all the good things he did for us appears to have forgotten that our gutters should have been covered or it was rather Governor Rowe or Rogers. Whoever it was who forgot about this, did a big disservice to us. Today, as a result of the oversight, here we are unused to this feature of modern cities. Taking a step away from our colonial gutters to the modern trend of covering, this network of gaping drainage system should be given high priority by both the city and local government authorities. 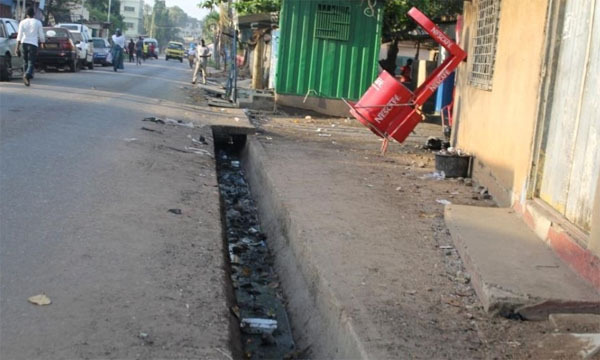 The Accra Metropolitan Assembly (AMA) Chief Executive Officer, Mohammed Adjei Sowah, might not have a big purse but covering gutters is one thing which should not be overlooked regardless of the reality of his wallet. For many years we have battled the choking of Accra’s gutters but hardly have we considered providing lids for these openings. It requires a great engineering feat to achieve given the possibility of rainwater not finding easy access to the covered gutters. We are not primed to advise such engineers about what to do suffice it, however, to state that it is possible to direct these streamlets from the assortment of sources into the covered gutters. It is important to get this right otherwise the covered gutters could be counterproductive. Others have done it and so we too can. A successful implementation of such a project would save us from the menace of plastic-choked gutters and the cost of clearing the mess. A large chunk of plastics generated from multitude of sources end up in the open gutters; some deliberately dropped in there by the many irresponsible citizens in the nation’s capital who couldn’t care the hoot about the consequences of their actions. When the gutters are covered, such persons would be denied these spots. Receptacles when put at vantage points should serve the needs of those who previously considered the open gutters as garbage points. Above all, our nation’s capital would be served a feature synonymous with the civilized world. The quickness with which we beautify our city when especially, important foreign dignitaries come visiting or even during those important dates on our national calendars, would be more enhanced should the eyesore of open gutters be eliminated. The Local Government Ministry should engage with the AMA to achieve this objective; the boss of the latter would have left a lasting legacy should he succeed with this project. We are standing by for the sod-cutting fanfare for the commencement of work on the dream.